So, What Are Google Shopping Ads? Google Shopping Ads are product listing ads that are shown in Google’s search and Shopping results. They are often displayed above organic listings for certain searches and include a photo of the product. These ads can also contain other information, including prices and reviews. Better performance than with text ads : Google Shopping Ads have a 26% higher conversion rate and a 23% lower CPC compared to text ads. 60% of search ad clicks in Q1 of 2018 were made on Google Shopping Ads. Qualified leads : Visitors who land on your website after clicking on a Google Shopping ad have shown high purchase intent, making them much more likely to complete a purchase. Since they’ve already seen how your product looks like in the ad’s image, they know what to expect and are less likely to leave your website without interacting with it, thus guaranteeing a lower bounce rate. Easy management : Google Shopping ads are easier to manage than regular text ads. There’s no need to create and manage keyword lists when using Google Shopping ads. Instead, you simply upload your product feed and create a campaign, which is then populated with your products. Are you convinced that you should incorporate Google Shopping ads into your advertising strategy? If you are, keep reading to learn how to start using these highly effective ads. Read up on Google Ads policies It’s crucial that you research Google Ads policies before you create your first Google Shopping Ads campaign. Google’s guidelines for advertisers are fairly strict. Failing to comply can get your account disabled very quickly. Don’t risk losing your Google Ads account. Before creating your first campaign, make sure to read the Shopping Ads Policies and the Merchant Center Guidelines. Google Ads - This is where you’ll create and manage all your campaigns. Merchant Center - You’ll send your product data to the Merchant Center so that it can be used to create your ads. Google Analytics - While setting up a Google Analytics account and connecting with your Google Ads account is optional, it’s extremely helpful for analyzing your campaign results. 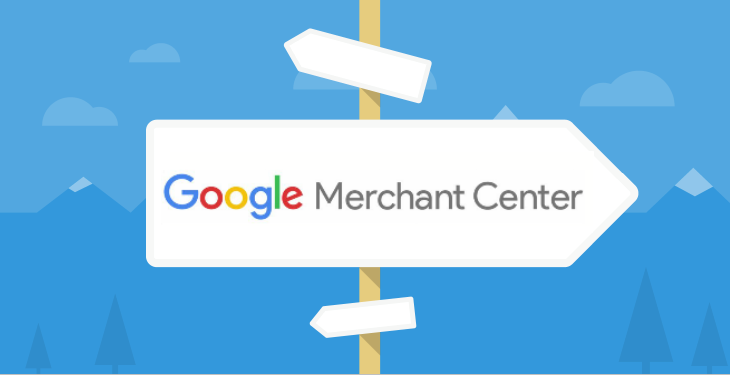 To be able to use Google Shopping Ads, you’ll need to send your product data to the Merchant Center in the form of a product feed. A product feed contains all your product attributes such as title, description, price, and URL. You can submit your product feed in a variety of different formats, including XML, TXT, and CSV. You’ll need to refer to Google’s product feed specifications first. To ensure the best results, you’ll need to optimize product attributes such as title, description, image, and category before you create your campaign. Optimizing your product data will help to improve your products’ ranking in both paid and organic search results. Keep it under 70 characters - While Google allows you to use a maximum of 150 characters for your product title, it truncates all titles that are longer than 70 characters. Start with the key term - Use the most valuable term at the beginning of the title. Include information shoppers need - Apart from the product’s name, include other useful information such as color or size. Think like a shopper - Consider what kind of information would a shopper like to see and try to incorporate it into the title. Optimizing product descriptions is similar to optimizing titles, with the exception that the character limit for descriptions is 5000 characters. You should still try to use your key term at the beginning of the description, include the most important information that shoppers will be looking for, and try to word the description in a way that would be appealing to shoppers. You can also refer to Google’ guidelines on product descriptions. As much as 93% of shoppers state that visual appearance is the main deciding factor when it comes to purchasing a product. This makes it crucial that you pay special attention to your product images. Use a high-definition image of a well-lit product on a white background. Don’t include text, logos or watermarks since these are against Google’s guidelines. Your product’s category can be a determining factor for displaying your ads for certain search queries. You need to make sure to choose the right category to ensure maximum visibility for your products. There are more than 5,400 product categories and subcategories available for Google Shopping products. You can download the entire list of categories here. Once you’ve prepared and optimized your product feed, you’ll need to send it to the Merchant Center. Depending on the number of different products and product variants you have, you’ll need to choose between your ecommerce platform’s native app, Google Sheets, or manual submission. 1) To start, log in to your Google Ads account, navigate to the Campaigns section and select New campaign. 2) Select Shopping as the campaign type. 3) Give your campaign a name. 4) Choose a bidding strategy. We recommend that beginners start with the automated bidding option. Once you get more comfortable with Shopping ads, you can switch to manual bidding to have more control over the performance of your campaign. 5) Set a daily budget. If you’re just starting out, a $10 daily budget should be fine until you learn more about running and optimizing Google Shopping campaigns. 6) Choose between Standard and Accelerated delivery. Standard delivery tries to deliver your ads evenly over time while Accelerated delivery is designed to deliver your ads as fast as possible. 7) Choose a campaign priority. 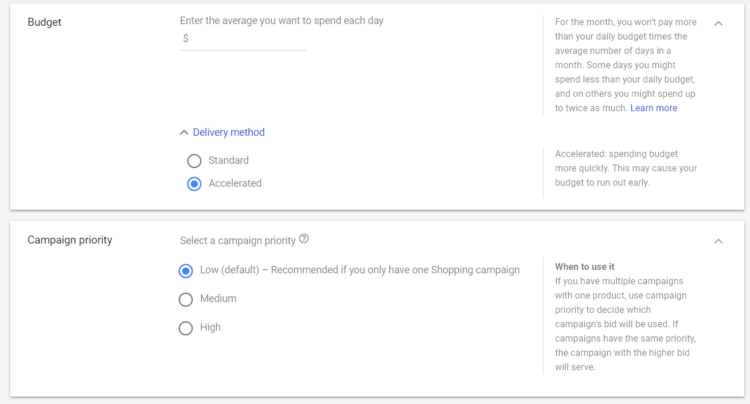 This option is very useful when you’re working with multiple campaigns since it determines which campaign will get priority in using up your daily budget. Since this is your first campaign, it doesn’t really matter what you choose in this section. 8) Decide on targeting options. The default option here is to target the Search network and Search partners. For maximum ad visibility, you should stick with the default option for now. 9) The final step involves Location Targeting, which entails choosing regions and countries where you want your ads to be displayed. Note that you can also set a start and end date for your campaign if you wish. This is particularly useful for running holiday sales. For now, you can focus on manually starting and stopping your campaign. 1) Select Product Shopping as the ad group type. 2) Name your ad group. 3) Set a maximum CPC bid. That’s it! You’re ready to run your Google Shopping ads. Once you have more data, you’ll be able to further structure and optimize your campaigns. Google Shopping Ads are a staple advertising channel for today’s retailers. If you’re running an ecommerce business, you should be using Google Shopping ads. These ads are very effective and have a higher conversion rate and lower CPC than traditional text ads. They also tend to drive visitors with high purchase intent. Google Shopping ads are very easy to manage and are automatically populated with products from your product feed. Before creating your Google Shopping campaign, you should read through the Google Ads and Merchant center policies to make sure that you’re staying within Google’s advertising rules. This will ensure that you don’t make a mistake that could potentially get your account suspended. Set up your Google Ads, Merchant Center, and Google Analytics accounts. Connect all of them to be able to reap the maximum number of benefits. Prepare your product feed and optimize it by customizing your product titles, descriptions, images and categories. Submit your product feed to the Merchant Center. Once your product feed is accepted, you can move on to setting up your first campaign and ad group. Do you need help with setting up or running Google Ads campaigns? We can help your business get started with running Google Ads campaigns. Our services include account setup and audit, keyword research, account structuring, ad copy creation and more. Are you ready to generate more sales with Google Ads? Fill out the form below, and we’ll reach out to you.